Talk of a confirmed hardened criminal fellow. 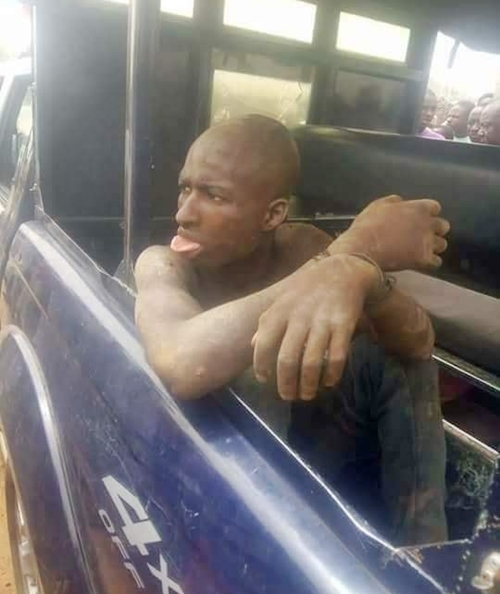 A notorious criminal who was recently apprehended by Nigerian security operatives was captured on camera sticking out his tongue to his haters who gathered to see him after his arrest. Some gallant security operatives in Gwaza area of Gusau, the Zamfara state capital, apprehended the dangerous criminal who is also said to be a cattle rustler. The suspected hoodlum was arrested following days of investigation by the security agents for allegedly stealing cows in the area along with members of his gang. After his arrest, the cattle rustler stuck out his tongue to the residents who gathered to watch the police officers take him into custody.